Not that we're doing a count-down here or anything but... we've got two weeks before our manuscript submission deadline of September 7th. Fortunately, two events (Peter had an ear problem and a small swell rolled through) plotted against us getting into the water as much as we would've liked this week. We say "fortunately" because it forced us to use that non-water time for working on the book. Peter had trouble with his ear. So Ursula dived while Peter snorkelled. Then we could get back to working on the book. We can't do that, however, because we realize that these weekly summaries form an important part of our "field notes." 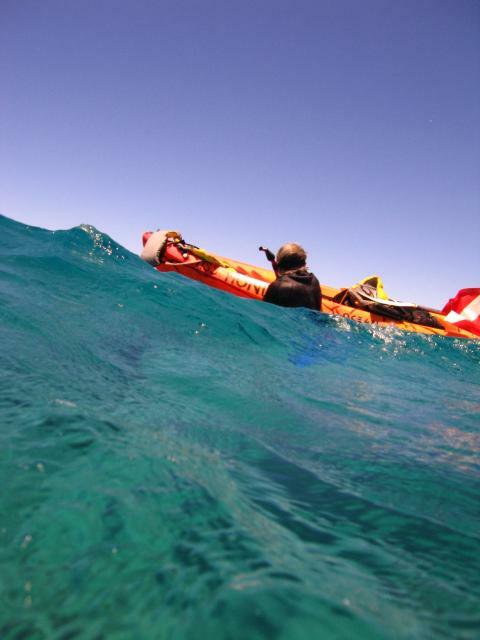 A North swell, silty water, wind-whipped waves, and vigorous trade winds turned paddling a kayak with a SCUBA tank at the bow into a session of "Man, we're idiots to be out here!" 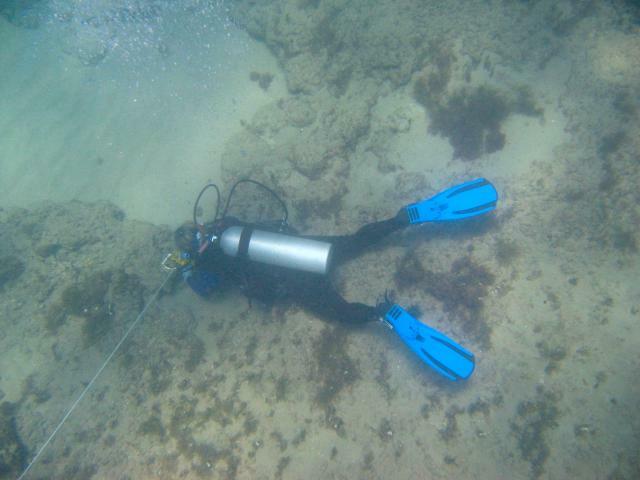 Since Peter couldn't dive, we were forced to limit his underwater viewing to snorkelling. That forced Ursula to keep her SCUBA sessions in shallow water. We must have made an even more odd couple than we usually make, at least to anyone observing from a beach or hotel balcony. Shouldn't this thing be horizontal...? An orange kayak tied off a couple of hundred yards offshore, bobbing up and down with wind and waves whipping around, and one idiot snorkelling around in what probably appeared to be random patterns. The system works--at least so far. Slowly we've investigated this new honu resting area to our north. Like any explorers seeing a place for the first time, we needed place names. This was the week for deciding on names and developing underwater signals to represent them. New dive site called "Hoaka"
Hoaka is Hawaiian for "crescent." 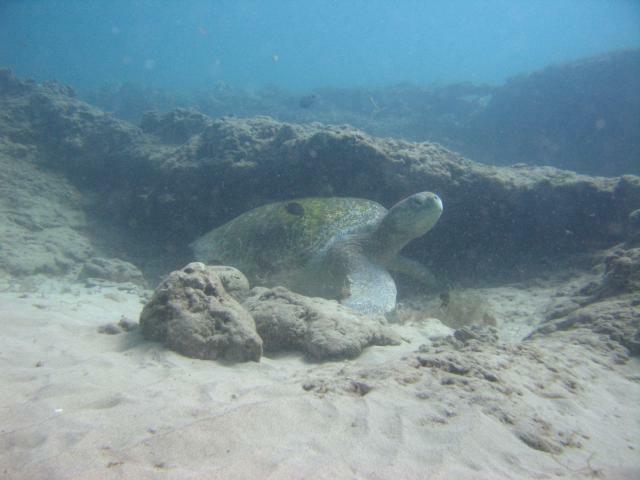 The prime attraction for honu to the north is a volcanic crescent-shaped ridge. 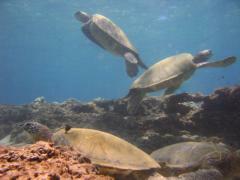 As many as a half-dozen honu can be seen tucked in deep shade in the volcanic rock ledges of this site. Hoaka is the extreme edge of Honokowai. 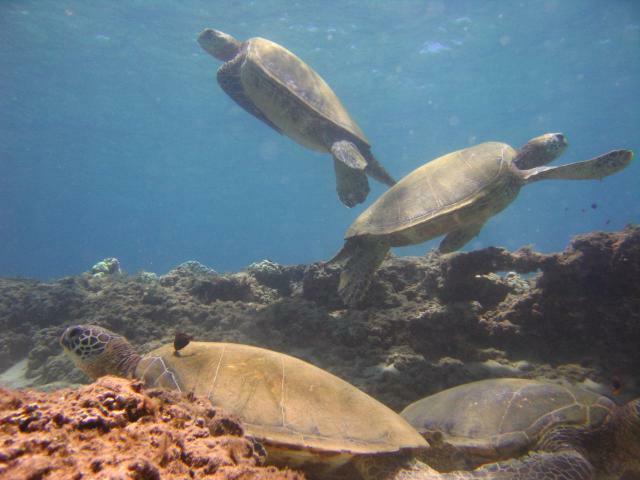 Since the vast majority of honu sighted at Hoaka are long-term residents of the Turtle House and North House, we still consider this area part of the Honokowai honu complex. 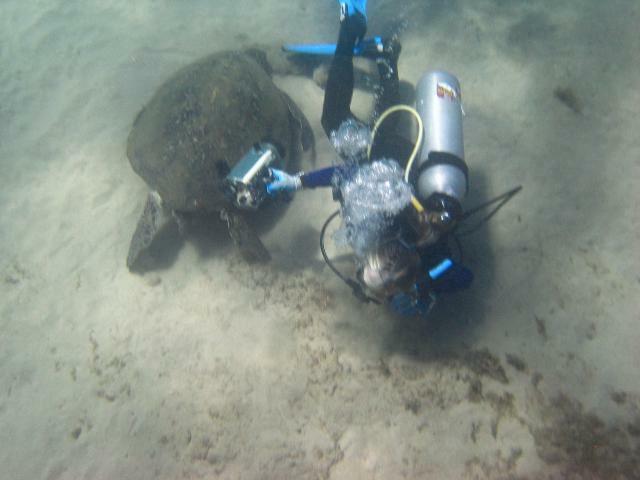 Hoaka (dive signal: hand curled into a crescent) is not just the ultimate honu safety rest site, it's also a cleaning station as well. 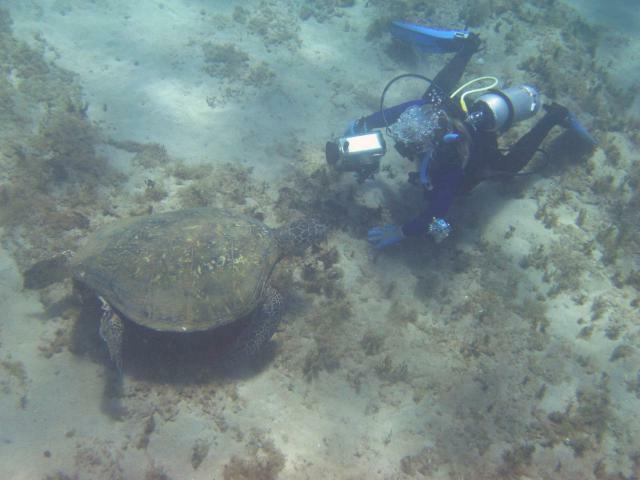 Usually a few honu can be sighted hovering above, we assume simply for the fun of it. Second new site known as "Kahua"
Among other things, Kahua is Hawaiian for "location, site" but also "bed, as of a stream." Since this is what the site looks like to us, it seemed the perfect name. Kahua is down-current and deeper than Hoaka. 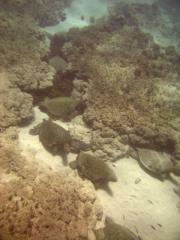 It is a place where honu go to to rest with other honu. In other words, it's a quiet place where it's possible to see a half dozen turtles huddled together in peaceful repose. Aside from going up for air occasionally, the turtles at Kahua do nothing else except pose for photos. $%$#%$#!!! meaning "expletive euphemism" is the non-Hawaiian name we give to the tiny volcanic "bridge" where we tie up the kayak. We call it $%$#%$#!! because even with a bright yellow rope wrapped around this anchor site, it still takes us what seems forever to find it. Then we have to snorkel down with our kayak rope and clip it to the yellow anchor line of $%$#%$#!!!. Once our dive/snorkel is completed and SCUBA tank safely back on board, one of us then must snorkel down to detach the kayak line. We both have extremely limited breath-holding abilities, hence the location name of $%$#%$#!!! is doubly appropriate. Ursula was harrassed. By two different turtles. 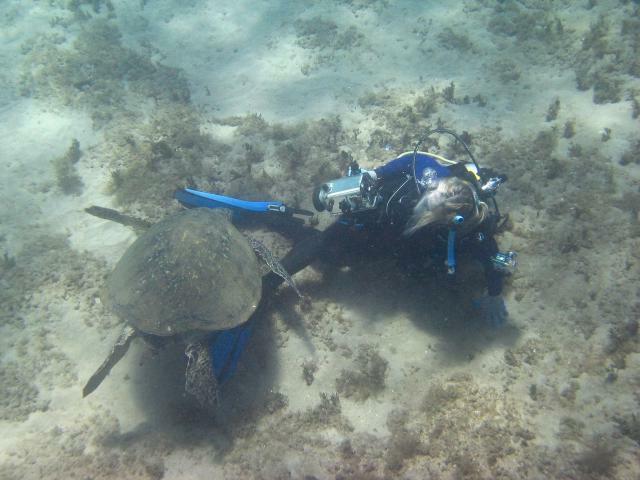 On the same dive. 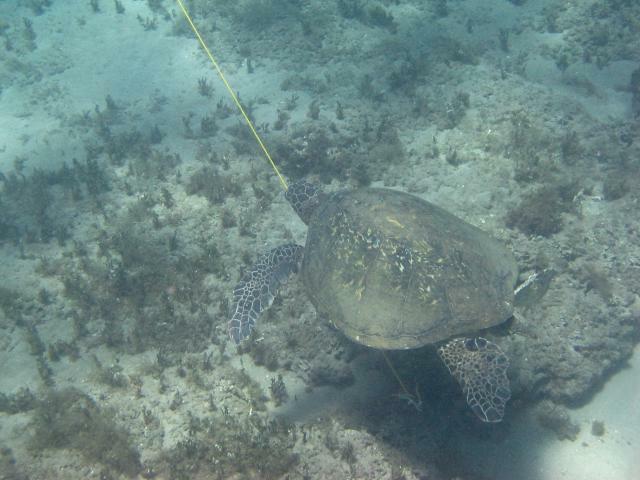 Since honu harassment is illegal, we'd report this (we have pictures for evidence!) but we don't want the turtles to wind up with a criminal record. They're really good honu, just misunderstood. 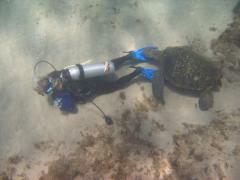 We've seen this kind of behaviour used on other honu. 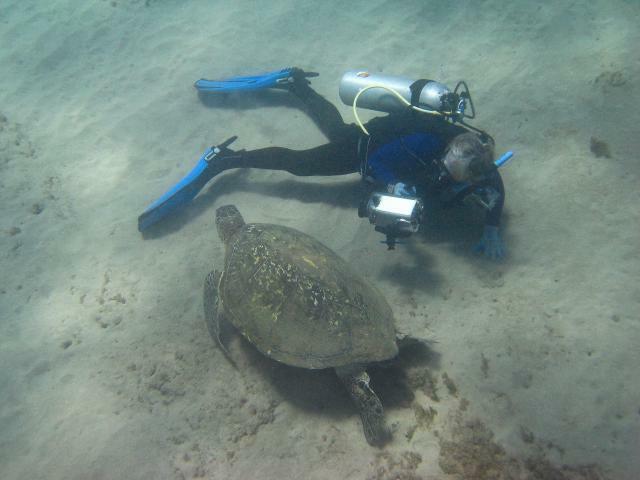 Speaking of other honu, another honu comes down from the surface, Peter signals to Ursula that it's sneaking up from behind. Ursula thinks, "Oh Great! Another one!" 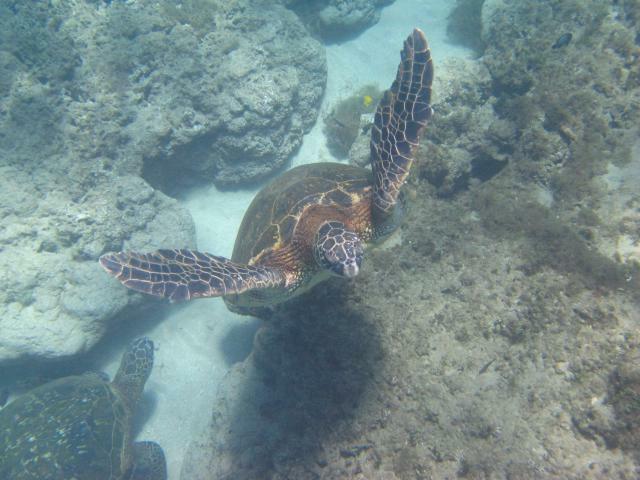 She immediately goes into her well-rehearsed, "I-know-how-to-mind-my-own-business honu pose." but to no avail. 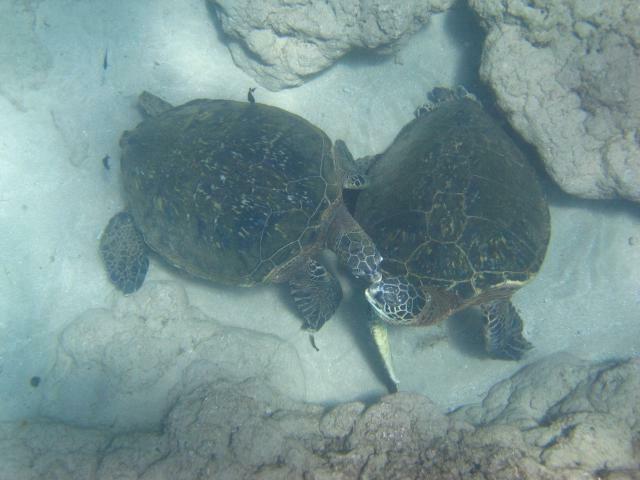 Unsatisfied with Ursula's lack of reaction, the turtle then swims over to a fellow honu and continues venting his spleen. Only THEN did he get the reaction he wanted! This week for no reason other than procrastination, we decided to visit Hoaka in the afternoon. A minor swell was running and we'd discovered that the Hoaka site was much like Olowalu in that once the waves came, the visibility left quickly. We also discovered that when surf was running, fewer turtles used the shelves and trench in these shallows. The visibility was so poor that Peter (snorkelling) had difficulty following Ursula (on SCUBA). Ursula had it even worse. Turning to look up against the sun and haze, even when Peter was close he looked more like a mirage. 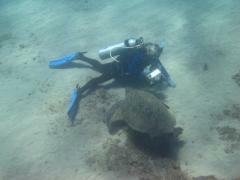 Poor viz, sand churned about, few turtles, we figured this was a scratch-effort--good only for the exercise it would provide us. Then we sighted Ho'omalu, our black turtle. She was resting (at times scratching her back) on the Hoaka "scratch post." Unlike Ho'omalu's nervousness at seeing us late afternoons while she was foraging, here, by day, she calmly accepted Ursula's presence and allowed numerous photos. 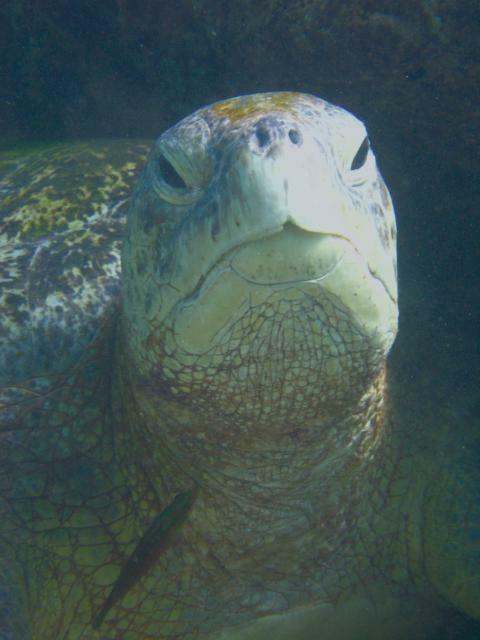 To Ursula's eye, Ho'omalu is bigger (and rotund-er) than most regular honu. 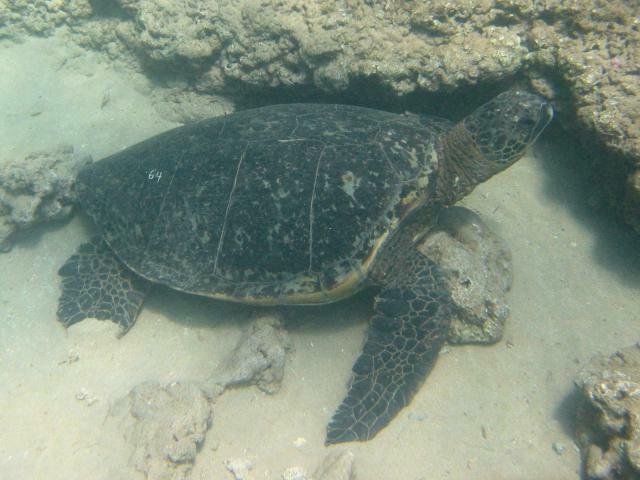 Ho'omalu, who is a black turtle/Hawaiian green combination, must surely be a female. There's no hint of a lengthening tail. We're delighted. Truly delighted. We believe it's only a summer or two before Ho'omalu will reproduce (if she hasn't already done so). 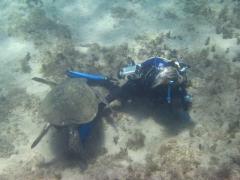 We hope to still be around to see her with a white number on her shell. Sighting Ho'omalu made the whole kayak trip to the north worthwhile! That's the big news this week. While visiting Hoaka on August 26th, we sighted one of our Honokowai wahine newly returned from her reproductive duties at East Island. She was resting peacefully on a sand ridge and Peter took this photo of her while he was snorkelling above. You can easily see the number "64" etched and painted into the right side of her carapace. We have known U249 since 1995 so this 2005 sighting makes it a ten-year Honokowai residency.